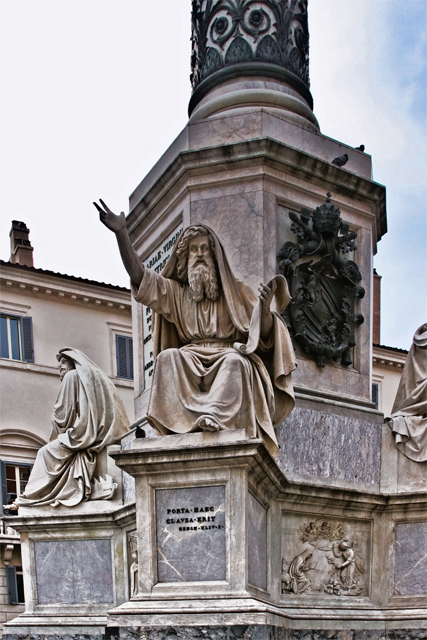 On Holy Saturday in 2009 we took a sightseeing bus around Rome and when we reached the stop for Piazza del Popolo we hopped off and decided to walk the rest of the way back to our hotel. The piazza begins at the ancient Roman Aurelian Wall and we entered through the city’s northern gate. 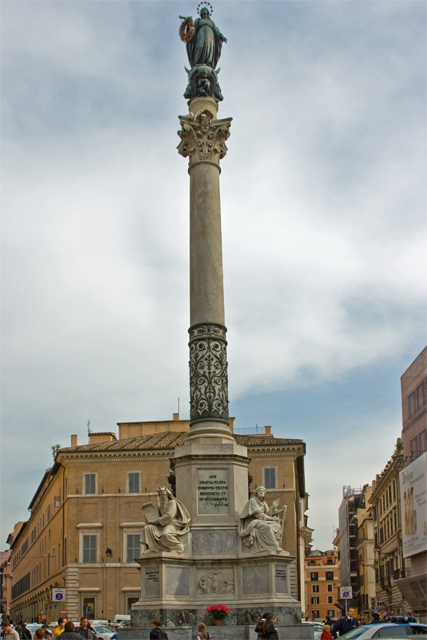 The Pope commissioned Bernini to enhance the Porta del Popolo for the expected arrival of the Queen of Sweden in 1655 (Queen Christina converted to Catholicism, abdicated her throne and spent the rest of her life in Rome). 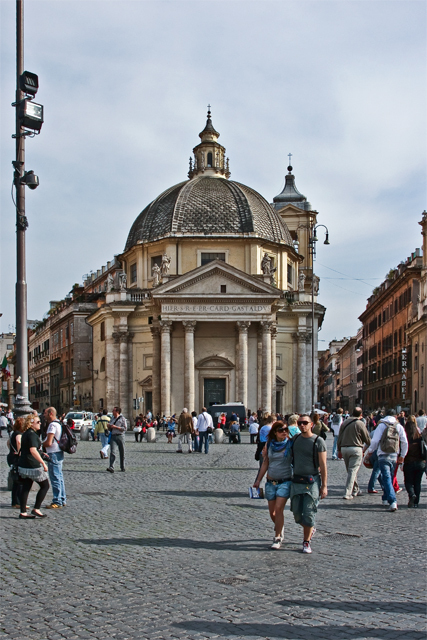 To the left of the gate is the church of Santa Maria del Popolo. On the right is a police station with a matching dome. 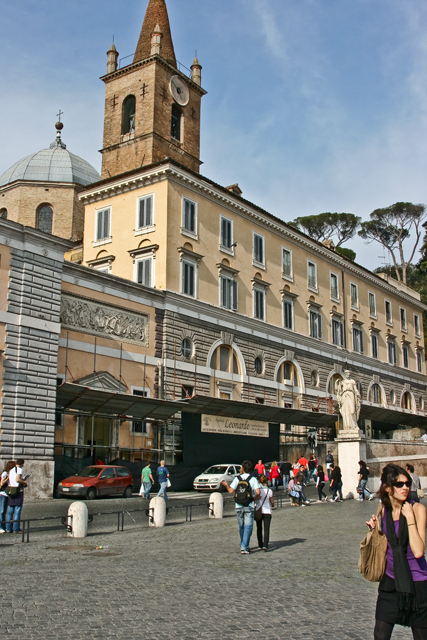 On the other end of the piazza are the twin churches of Santa Maria dei Miracoli and Santa Maria di Montesanto. The Tiber river and the Vatican are off to the right and Pincio Hill is to the left. 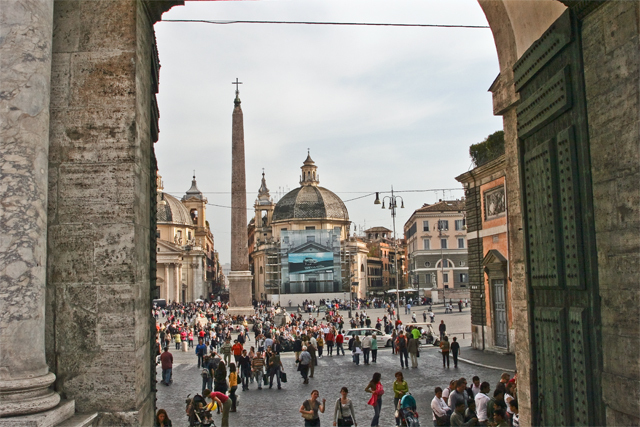 In the middle of the oval-shaped piazza is an authentic Egyptian obelisk brought back to Rome by Caesar Augustus. Four lions guard the fountain that surrounds the obelisk. 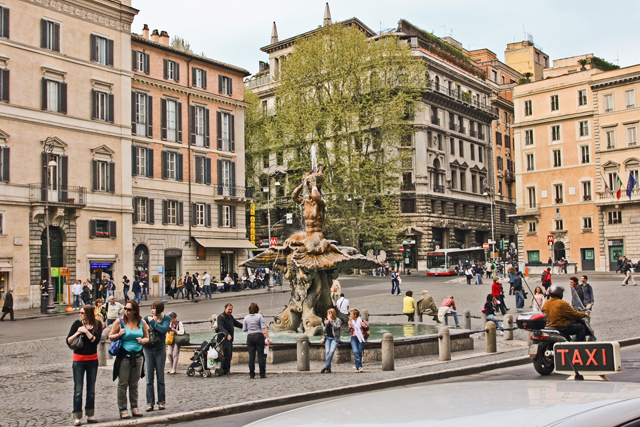 Three streets collectively called The Trident lead out to central Rome from the south side of the piazza. 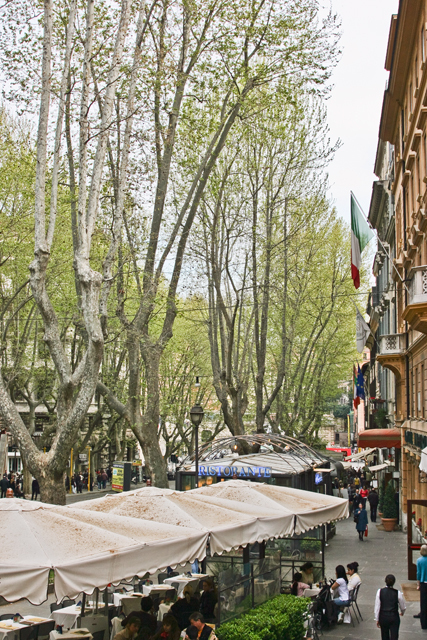 There is Via del Babuino on the left of Santa Maria di Montesanto and Via di Ripetta begins to the right of Santa Maria dei Miracoli and eventually reaches the shores of the Tiber. 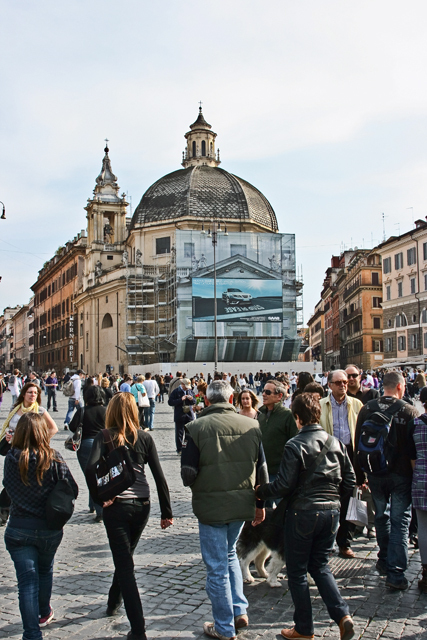 Via del Corso is the street between the twin churches and it goes all the way to the Piazza Venezia and the imposing Victor Emmanuel monument. You take this street if you want to go shopping in Rome. 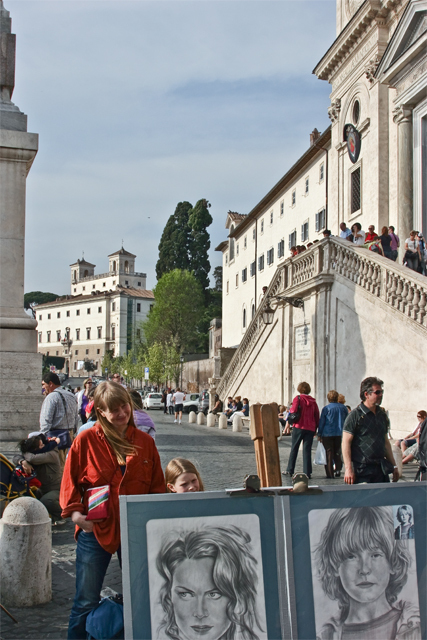 But we chose Via del Babuino because it is the most direct route to our next stop, The Spanish Steps. Via Del Babuino ends at the Piazza di Spagna. It’s a pleasant walk of about seven blocks. 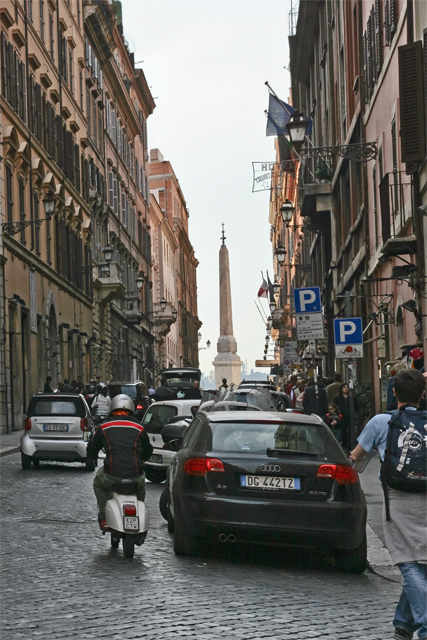 Only one or two cars dared to enter the street and most pedestrians just walked in the middle of the street most of the way from Piazza Popolo. All of a sudden a thousand people appeared to our left. 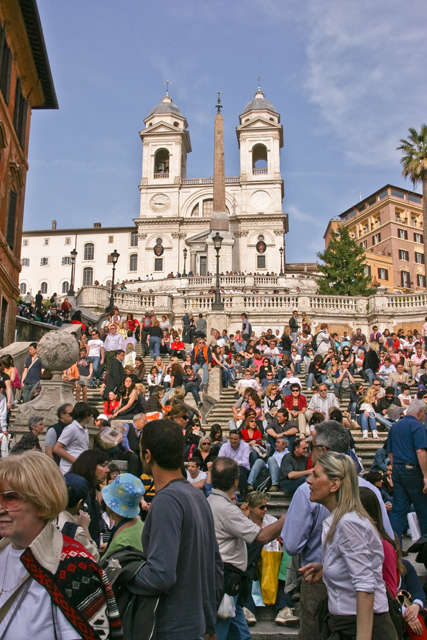 We visited the Spanish Steps three times during our week-long stay in Rome and it was crowded all three times. Vendors and artists sell their wares in front of the church. 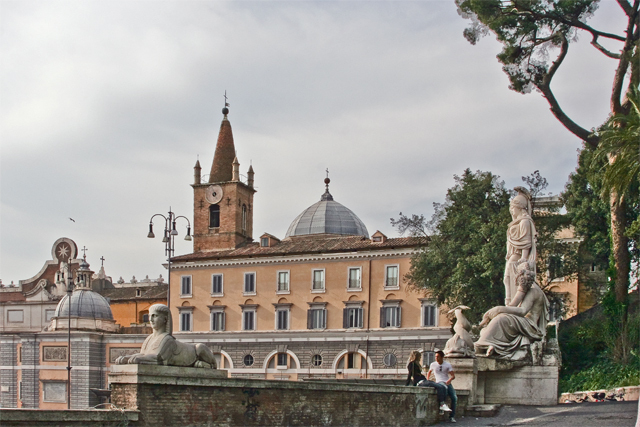 The building in the background is the Villa Medici which today houses the French Academy in Rome. 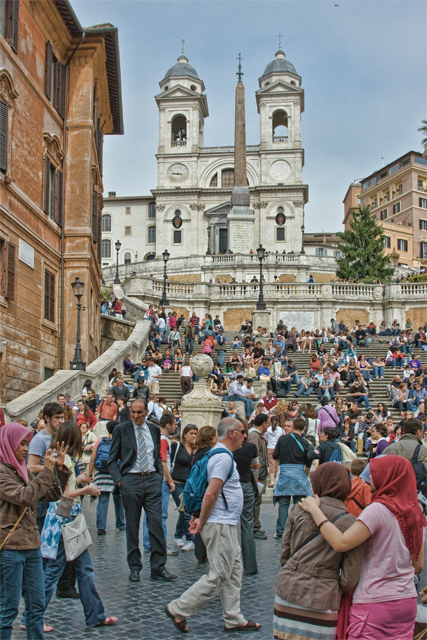 The steps are the widest in all of Europe. 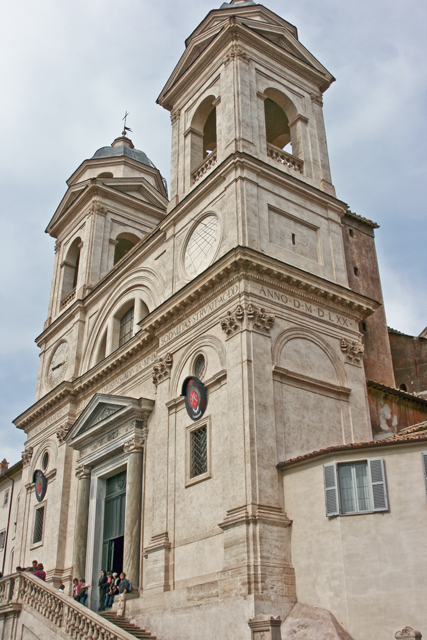 At the top of the steps stands the church of Santissima Trinita dei Monti. 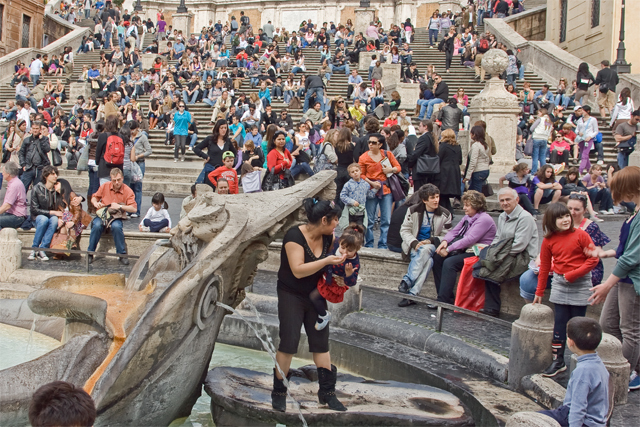 At the bottom is a boat-shaped fountain called the Fontana della Barcaccia that was designed by Pietro Bernini, father of Gian Lorenzo. 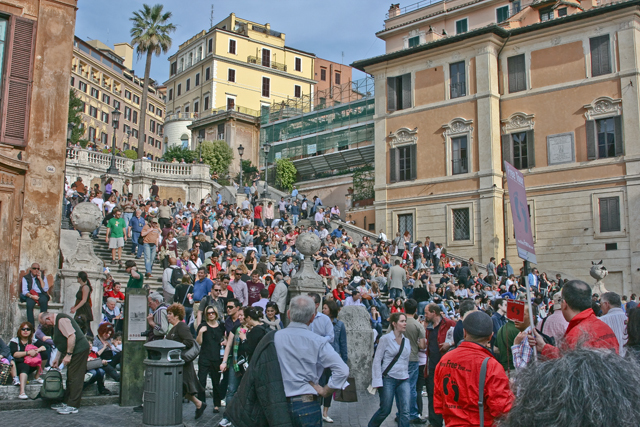 The building to the right of the steps is where the poet John Keats died in 1821. The poet’s epitaph, “Here lies one whose name was writ in water,” refers to the fountain’s water that he could hear on his deathbed. One time we left the area from the top of the steps in front of the church. 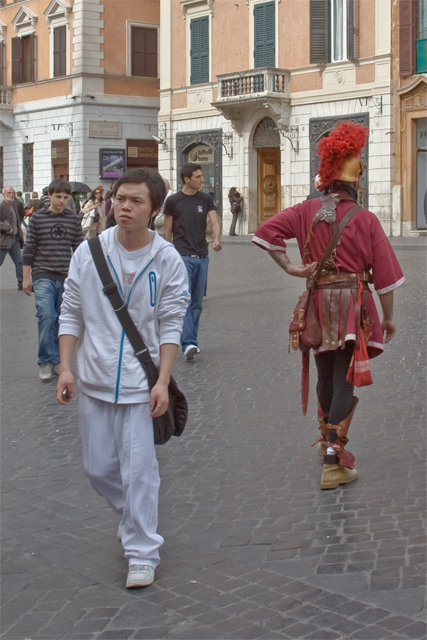 We then took Via Sistina all the way to Piazza Barberini. 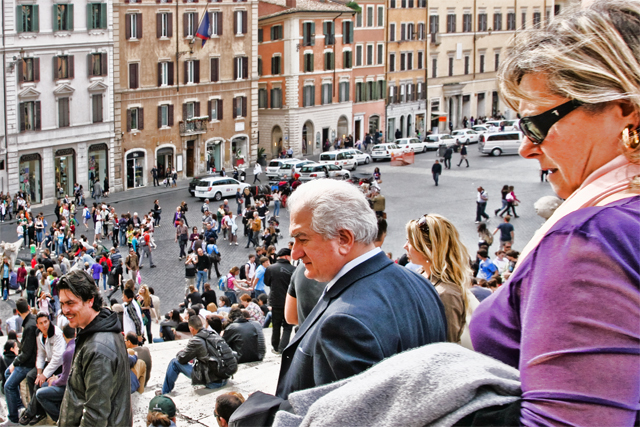 But on Holy Saturday we left from the bottom of the steps and so continued walking south on Via dei Due Macelli and then east on Via del Tritone to Piazza Barberini. It’s a little longer than the Via Sistina route but not as steep. 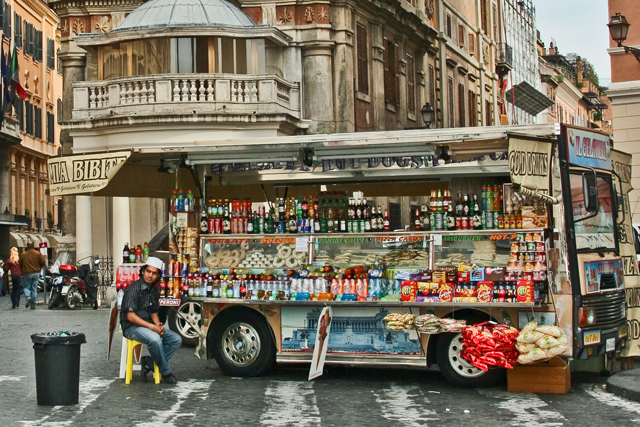 We passed a mobile restaurant on the way to Piazza Barberini. 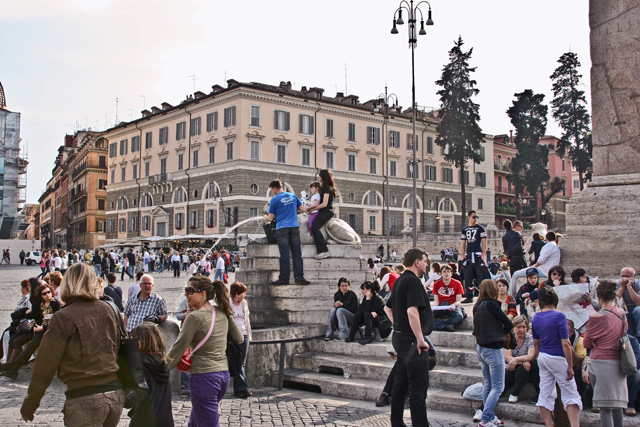 Piazza Barberini. The metro station here was the closest to our hotel. 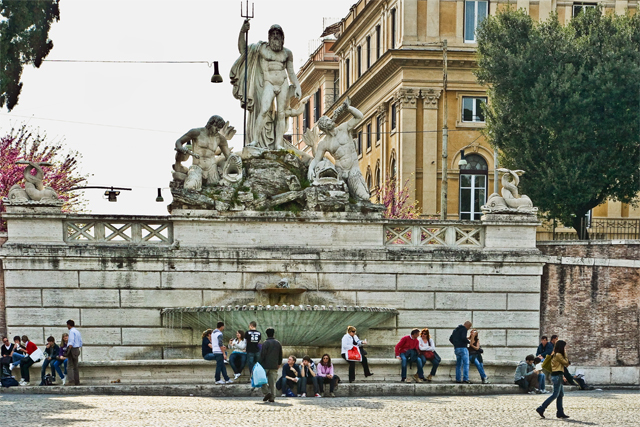 The Triton Fountain was sculpted by Gian Lorenzo Bernini. Via Veneto of La Dolce Vita fame begins at Piazza Barberini. The street was named after one of the last major battles of World War I. 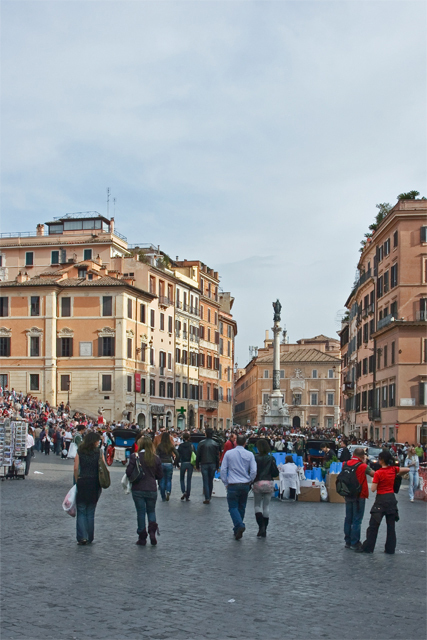 We walked either to or through this Piazza each and every day of the seven days we spent in Rome. Three times we walked to catch the Metro and the other four times we passed by on our various city strolls. Via Veneto winds its way up to the Roman wall and ends there. 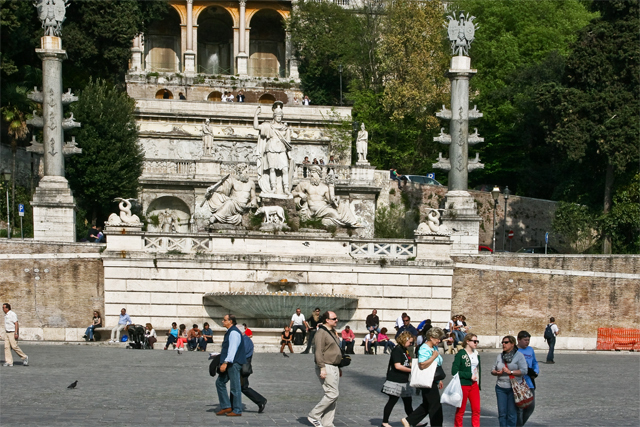 The Borghese Gardens begin on the other side of the wall. After a couple of blocks from the Piazza Barberini the Via makes a big “S” curve. There are steps (Via Emilia) at the center of this curve that go to the next street up (Via Liguria) and then it’s only a hop and a skip to our hotel. 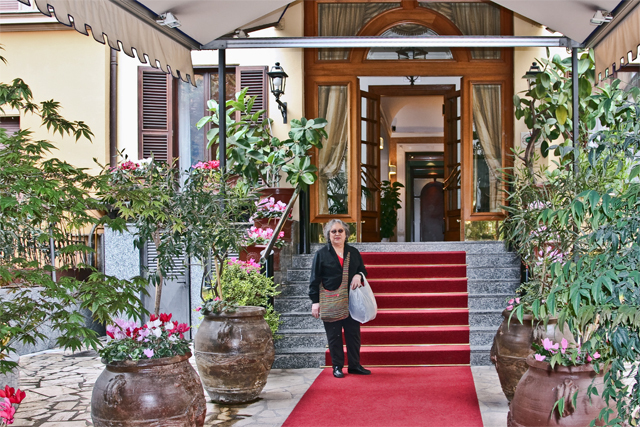 Our walk ended at the Hotel La Residenza on Via Emilia. 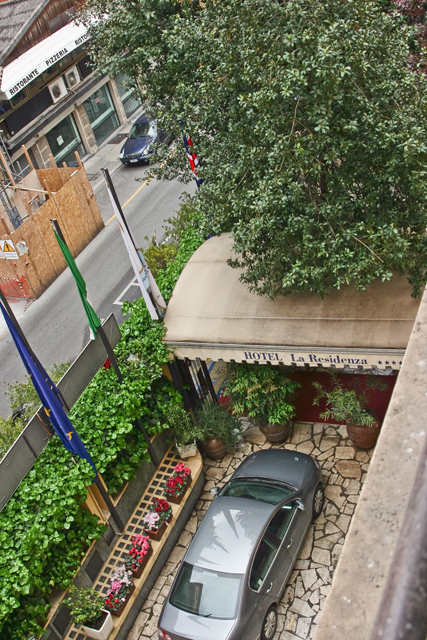 We chose this hotel because it was highly recommended by TripAdvisor and was within walking distance of most of the sights we wanted to see. Their breakfasts were delicious and they also twice a week threw lively parties for their guests, including live music and complementary wine and hors d’oeuvres. 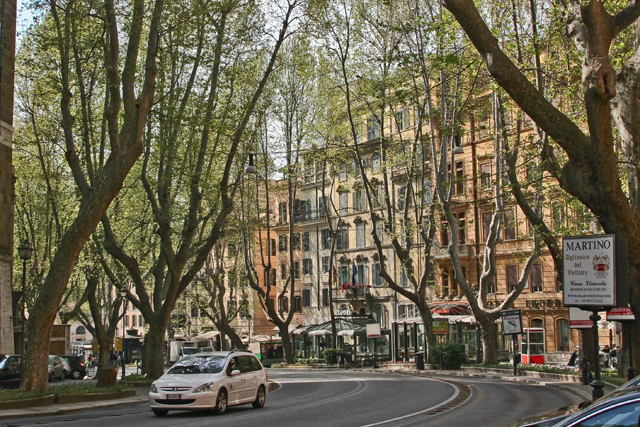 The Via Veneto area has lost some of its luster since the days of La Dolce Vita but we encountered no danger on our daily walks around the neighborhood. 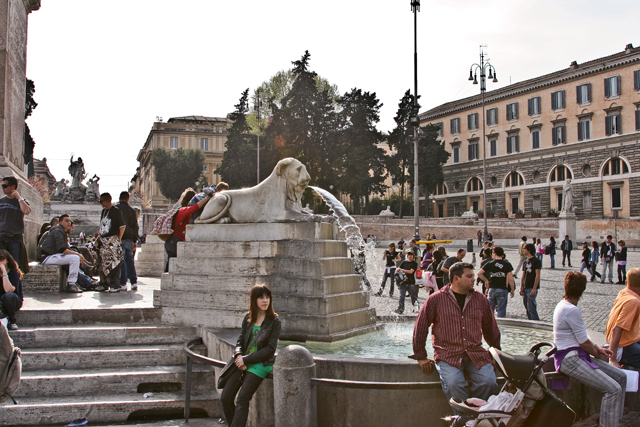 The morning walks were easy because everything except the Borghese Gardens are downhill from our hotel. In the evenings, however, we huffed and puffed uphill all the way to our hotel. But we slept well every night! 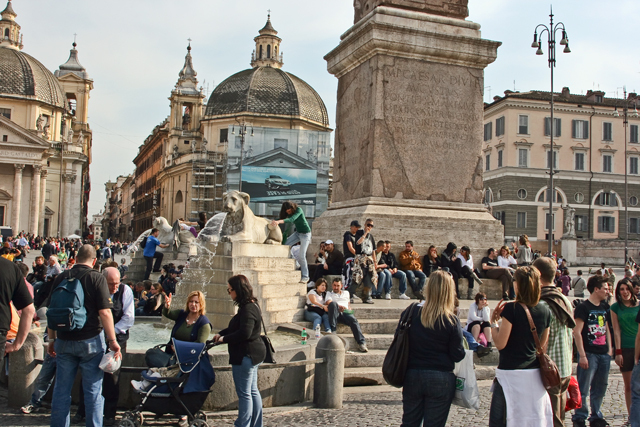 This entry was posted in Rome, Travel and tagged favorite walk, Italy, photography, Piazza Barberini, Piazza del Popolo, Rome, Spanish Steps, travel, travel photos, Via Veneto. Bookmark the permalink. Wow, such beautiful photos! I am a WordPress photographer as well, so I love when I see posts like this! Great job, keep it up! Lovely shots – you really capture the ‘feel’ of the place…I wish I was there now!